Chitika Premium just released its WordPress plugin. It is so much easier to insert the Chitika Premium ads into our blog posts. Just download the Chitika plugin, upload it and select your choice of ads size. I like Chitika Premium because it doesn’t appear to our regular readers as it is targetted only for search traffic. With the plugin, it is so much easier to view the kind of ads on our site. Here is a two years old post related to Santa. 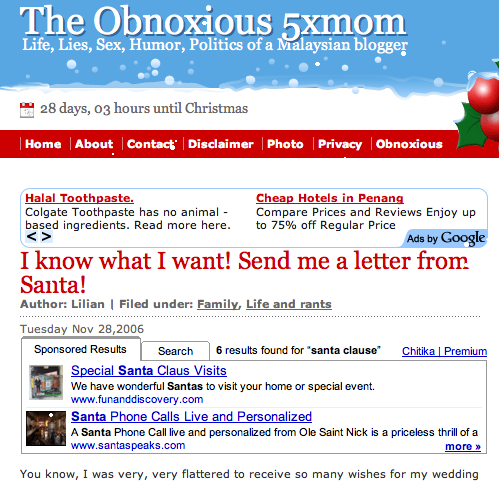 Notice how relevant the ads from Chitika is compared to the boring old G when people look for Santa? I know the post looks like a piece of crap due to the number of ads but hey, who cares if the random surfers read what masterpiece we wrote or not? I am only interested in getting money from the clicks. I just want them to get so turn off and head for the nearest exit, i.e. the ads. LOL. Sign up for Chitika Premium here and you can also download the plugin. i also already put it at my blog. but people from malaysia will never can show that chitika premium ads..
Hi, I just applied to Chikita through your link, hopefully I will be accepted and start making money.